Aritz Aduriz: Late Bloomer or Old Wine? In a time when youthful talent is coveted more than ever, especially in the goal-scoring and attacking roles; Aritz Aduriz is breaking barriers and reshaping paradigms. Gabor Kiraly and Gianluigi Buffon are testaments that age sometimes is just a number in football and doesn’t always correspond with ability. Some might say this is understandable since the pair aren’t outfield players and don’t have to run around much on the football pitch. 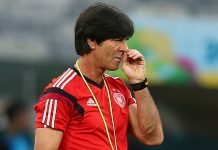 Furthermore, it is generally agreed that goal keepers and defenders peak late in their careers; managing to keep their game top-notch well into their late 30’s. A few midfielders─ Francesco Totti comes to mind─ have also been able to manage this feat in the current football dispensation. Buffon is arguably the best goal keeper in the modern Era. Old but gold. Generally, strikers and forwards aren’t so lucky. Most hang their boots around their early to mid-thirties. This might largely be due to the fact that they are more susceptible to critical career threatening injuries. It is also likely that as they age they lose vital physical abilities like speed and flexibility essential to their survival and dominance on the pecking order. Against this backdrop, how does one then reconcile a 35 year old striker averaging a season total of 36 goals in the Spanish top-flight? Especially considering the average age (28-30) most strikers begin to wane. Meet Aritz Aduriz Zubeldia A.K.A ‘El Zorro’ (The fox); whose story is one of patience, long-suffering, rejection, perseverance and audacious fortitude. Aritz Aduriz is certainly not your everyday 35 year old. Growing up in the hilly Basque region of Spain was perhaps crucial in preparing him for a lifetime of aerial conquests and exploits. But this would be in a different sport from that in which he first gained prominence. Already a good surfer, mountaineer and snowboarding enthusiast; Aduriz became a runner-up in a national cross-country skiing championship at the age of 9 and although he rarely got to see games anywhere, football was the sport he really desired to be great at. It was an idea that didn’t sit well with his parents who preferred mountain sports and he eventually had to negotiate with them to get his way. His first stint was at local club Antiguoko in 1998 where he played alongside notable Spanish footballers like Xabi Alonso, Mikel Arteta and Andoni Iraola. He soon joined second division side Aurrerá de Vitoria in 1999 appearing 25 times and scoring only 8 goals. Joining Bilbao Athletic (Athletic Bilbao’s youth team) in 2000 was a turning point in his career. It also marked the start of what was to be an on/off relationship with the club. After a 2 year period in the trenches, Aduriz was promoted to the senior side with German coach Jupp Heynckes handing him his debut game. That was to be the first of only three games he would play for he was soon sent packing on loan to Burgos and thereafter Valladolid. He returned to Athletic in 2006 much more refined and experienced and even though he averaged 22 goals in a total 82 appearances, Athletic still weren’t ready for him. Thus began the Mallorca years─ where he was to see more games than he would play. The problem wasn’t Aduriz; it was who he had to compete with. At that time, there was an in-form Fernando Llorente marshalling the Mallorca attack which meant lots of time in the trenches for Aduriz. Despite this obvious handicap, he managed to be the team’s top scorer in the two years he spent there; scoring 11 goals in the first and 12 in his second year. Still, Athletic weren’t impressed. He was 29 and at the tail end of his career or so they thought. Valencia seemed impressed enough and they soon hired his services for about €4 million in 2010. Unfortunately, the storm wasn’t over yet as Aduriz resumed bench-warming duties at his new club. His newest rival for the striking role was Roberto Soldado who was preferred over Aduriz by then Valencia coach, Unai Emery. Resilient as ever, he trudged on and outdid his previous record by adding 2 to his previous tally of 12 goals per season at Mallorca. Perhaps out of pity, Athletic bought him from Valencia in 2012 for a fee around €2.5 million. He signed a 3 year contract which many considered would be his last. But Aduriz had other plans. Even though 31, he just wasn’t done yet. Yet again Aduriz faced the familiar second-best tag that had plagued his career up to that point and it was the same guy he had been compelled to watch so many times while at Mallorca─ Fernando Llorente. Fortuitously for him, contractual scuffles and the Old lady’s beckoning soon forced Llorente out of Athletic and away to Turin. First bout won for Aduriz; San Mames was his. His next target was to stamp his dominance as Athletic’s go-to man for goals. This he did in exceptional style scoring braces on the regular in both the domestic league and Europa league. The highest point of his career would come against Spanish giants Barcelona in the Supercopa de España (Spanish Super Cup) final of 2015 where he scored a hat-trick in the first leg which ended 3-0 and netted the equaliser in the second leg at the Camp Nou which ended 1 apiece. 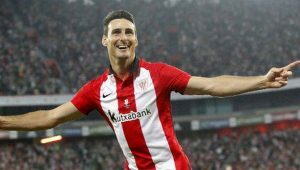 With this singular feat, Aduriz ended a 17 year old career-long wait for a medal and Athletic’s 31 year old wait for a trophy─ this at the age of 34! He reached the 100 goal mark for Athletic that year, netting 11 goals in 14 games. Athletic finally recognised his genius and offered him a contract extension to 2017. Perhaps to prove his exploits weren’t just some flash in pan heroics, he scored an outstandingly brilliant bicycle kick against Eibar in a league game in January 2016. Then he followed it up with a spectacular strike against Olympique de Marseille in the Europa League 7 days after his 35th birthday. 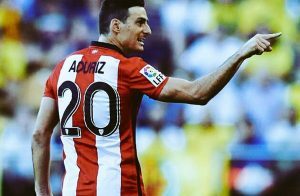 In March 2016, Aduriz became the first Athletic player to win the Zarra Trophy (La Liga Player of the Month). Although, they were eventually knocked out of the Europa League courtesy of Spanish rivals Sevilla, Aduriz ended up as the competition’s top scorer with 10 goals; his overall goal for the season amounting to 36 goals─ perhaps, it was his way of icing his 35th birthday cake. 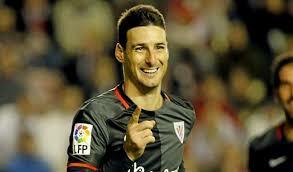 Aduriz who is regarded as the ‘Benjamin Button’ of football, is a marvel on the football pitch. Despite his age, he’s quite pacy with extremely quick reflexes on and off the ball. His spatial awareness and reading of the game is also top-notch. Even though just shy of being 6 ft., his aerial prowess is in the realm of the Bierhoff’s and Ibrahimovic’s of the football cosmos. 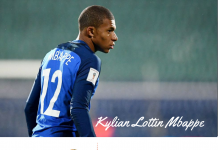 His ability to hold play when necessary without losing possession has also embellished his role as the ‘lone fox in the box’ for Athletic Bilbao in recent times.. He already has 4 goals in 7 appearances for the San Mames side this season with an unspoken promise to score more. 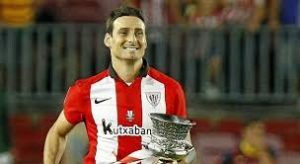 Aduriz greatest coup isn’t that he defies physics when he scores sometimes; or that he fought his way to become an Athletic legend; nor is it that he received his first call up to the Spanish team at 35; his greatest coup is that after all these years he has managed to stay winning in a war against time. Previous articleWhat Be Diego Costa, If Not Belligerent? Next articleWhat Is Disrespectful About Neymar?